While girl gamers do play a wide variety of video games that many wouldn't consider to be the stereotypical girls' games such as Call of Duty, Battlefront, and Halo, there are undoubtedly some titles that have attracted a predominantly female fan base more than others. 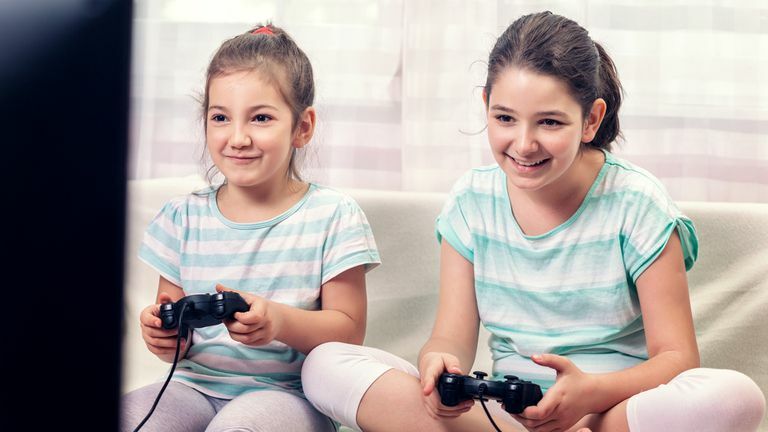 Sometimes such games are popular because of a connection to a hit girl's TV series or are based on a fun activity that is traditionally popular with girls. Other times, girl gamers like these video games because they feature strong female characters that they can either relate to or aspire to be like. The types of video games that girls like nowadays is just as varied the types of titles that boys like but here are 10 fun games that tend to get the most praise from this demographic and would make a great gift to any female friend, family member, or gamer in your life. Breathtaking graphics that showcase Lara Croft and the island brilliantly. A well-written storyline with realistic dialog and characters. May be a little too realistic for fans of the wilder elements in the original games. Less of a focus on actual tomb raiding. Tomb Raider Definitive Edition is the first in the new series of Tomb Raider video games that rebooted the character of Lara Croft to be a deeper and more realistic character than her original 90's form. Here, Lara is a strong, independent young woman with smarts and a full range of emotions which are both put to good use after she's stranded on an island and must solve an ancient mystery and fight to stay alive against a group of violent criminals. Loads of content for players to unlock and all for free. Lots of locations, characters, and songs from the My Little Pony TV series. There are a lot in-app purchases that can speed up certain tasks. Players are encouraged to watch advertisements to earn in-game currency. My Little Pony: Magic Princess (previously My Little Pony: Friendship is Magic) is a free-to-play mobile game based on the popular girls cartoon and toy line of the same name. When the game was first released, it was a basic city sim where players could build and manage their own Ponyville town and welcome some of their favorite characters from the show. The Windows 10 version of Magic Princess is literally years behind the other versions in content updates so it's worth installing the iOS or Android version instead if you have the option. Since the initial launch, the game has evolved significantly and now features several towns and areas to manage, an absolutely massive cast of characters to welcome and level up, and a good variety of mini games from ball bouncing to even a dance rhythm game. Lots of female Overwatch streamers on Twitch and Mixer. Loads of character skins for characters to dress up in. First-person perspective may cause motion sickness in some individuals. No offline mode to play. Overwatch is a popular first-person online shooter that has taken the world by storm since it first launched in 2016. While most shooters have a predominantly male userbase, Overwatch has attracted a large female following due to its focus on characters and supplementary material such as animated shorts, comic books, and even Funko Pop figures. Overwatch is a first-person video game. This type of video game can cause motionsickness for those that feel ill while traveling or when using a VR headset. Those who give Overwatch a go are bound to connect with other female fans and there are a growing number of prominent female Overwatch streamers on Twitch and Mixer that prove that online gaming is no longer just a boys club. The Kinect is great fun for younger players. It's an Xbox Play Anywhere title which means you can buy it on Xbox One and unlock it on Windows 10 for free. Graphics aren't as detailed as they could be. Some of the rides are fairly slow and will bore older gamers. Disneyland Adventures is the perfect video game for girls who love Disney movies and going to Disney theme parks. In Disneyland Adventures, players get to visit a digital recreation of the popular theme park and ride the attractions and even talk to the characters that hang out at different locations. Xbox One owners who have a Kinect sensor can use the motion controls to control their character and move them around. This is particularly fun for young children who have a hard time staying seated for long periods of time. Traditional controller and keyboard controls are also available. A beautiful soundtrack that will stay with you. Gorgeous creature designs and environments. Unavailable on Nintendo Switch or PlayStation 4. Can get very difficult in later stages. Ori and the Blind Forest is one of the best platforming titles available on any platform. The game features pitch-perfect controls and level design and is accompanied by a fully-orchestrated score and an art style that's both surreal and magical to watch at the same time. Ori and the Blind Forest isn't just technically brilliant, it also has a lot of heart and is surprisingly emotional to watch, let alone play. Perfect for female gamers looking for a bit more bit in their platformers. Covers all aspects of owning a horse really well. Good customization options to make the game feel more personal. The human avatar isn't as well designed as it could have been. No local or online multiplayer. My Little Riding Champion is the ultimate fantasy fulfilment for girls who have ever dreamed of owning a horse. In My Little Riding Champion, players can fully customize their physical appearance and select a race horse of their choosing. The game has a strong focus on getting the player to bond with their horse and teaches you how to look after it instead of simply treating it as a status object. There is some fun to be had, though, with numerous competitions to enter and an open-world that can be explored freely on horseback. Girls with an Xbox One X will get the most out of this game as it will display in full 4K resolution when played on that console. A strong female character that's a joy to play as. Beautiful music and level design. The art style may not appeal to everyone. Celeste is skilfully crafted platform game for modern consoles and PC that incorporates old-school 8-bit sprites for its gameplay and manga-inspired artwork for the dialog and cutscenes. The game follows the female character, Madeline, as she attempts to climb a mountain called, Celeste, while navigating the treacherous obstacles that block her way. Fantastic voice acting and character models. Feels like watching a CW drama at times. Some violence and sexual references rule out pre-teens gamers. The overuse of the word "hella" feels hella forced at times. Life is Strange is an award-winning video game about a teenage student who must deal with her personal drama all while trying to make sense of a mysterious power that allows her to turn back time. The main thrust of the game is its focus on dialog choices with other characters that can be used to solve mysteries and evolve relationships but there's also some rather enjoyable exploration of the game's beautifully-rendered environments to be had as well. There are instances of dialog that feel like the writer is trying a bit too hard to sound hip and trendy, such as the constant use of the word "hella" by almost every teen character, but overall the writing is incredibly solid and creates the illusion of interacting with an actual teen drama on TV. Life is Strange is highly recommended for any female gamer who watches teen dramas like The 100, Riverdale, or The Chilling Adventures of Sabrina. Aloy is one of the strongest female characters in modern gaming. Only available on PlayStation 4 consoles. Some sidequests can feel a little predictable. Horizon Zero Dawn is an action-roleplaying game that has been praised by critics and fans for its stunning visuals, emotive storytelling, and strong female protagonist. In it, players control the female hunter, Aloy, as she explores a beautiful fantasy world full of mysterious creatures and cultures. There's an equal emphasis on story, exploration, and action in Horizon Zero Dawn that will keep most players engaged for the full single-player campaign with loads of additional content to discover for those who like to take their time. Best Karaoke Video Game for Sleepovers: We Sing Pop! A good selection of songs to choose from. Karaoke competition modes keep things interesting. At least one Xbox or PlayStation compatible USB mic is required. No option to buy new songs to expand the library. We Sing Pop! is a video game that turns any Xbox One or PlayStation 4 console into a karaoke machine. The game features a large library of 30 popular songs accompanied by HD videos and, of course, karaoke subtitles that light up as each word needs to be sung. In addition to the regular casual karaoke mode, We Sing Pop! features seven additional modes for competitive multiplayer karaoke sessions that can pit singer against singer or team against team. This is the ideal game for sleepover parties and is also the best karaoke video game on PlayStation 4 and Xbox One after Ubisoft canned their Just Sing game in mid-2018.